When Revolution was created in February 2015 by STI (Specialty Textiles, Inc.), it was only available for sale to furniture manufacturers. That all changed in January 2017 when Revolution launched it's online store, revolutionfabricbytheyard.com. Revolution was so well received in the furniture retail market, that customers began asking for furniture only covered in Revolution! Now, anyone who wants a PFC chemical free, easy to clean fabric that is made in the United States, can purchase Revolution whenever they want. Another huge component of Revolution's online store is their trade program. Interior designers who join Revolution's trade program receive trade pricing and receive a complimentary Revolution designer swatch box set. Revolution is great for all designers, because "life happens" in every home, but it is really great for designers whose main clientele is families or like many of us, people who are redecorating on a budget! 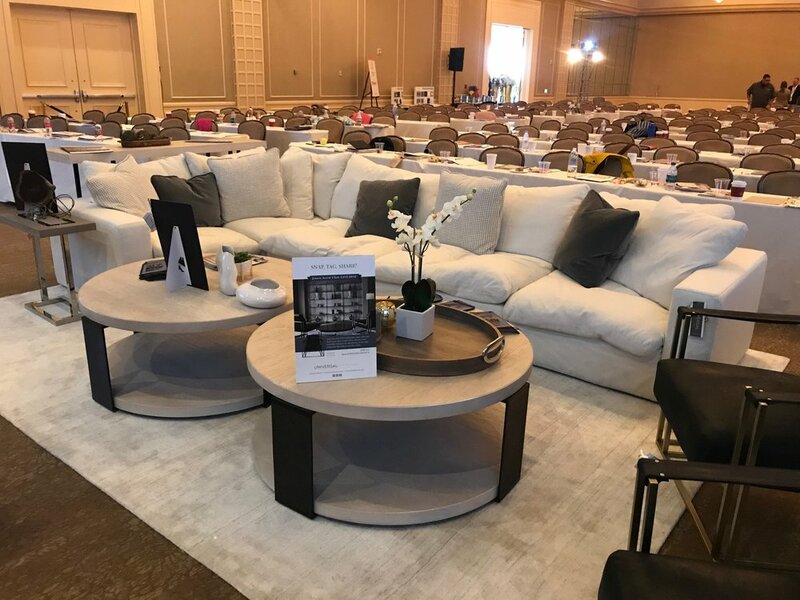 Revolution Performance Fabrics attended and was a sponsor at this year's Designer Blog Conference in Los Angeles, California. The conference has taken place for over five years and now has close to 400 attendees! The conference is specifically focused on the interests of interior designers, design bloggers and anyone who is using the web and blogger networks to grow their brand. There are seminars and break out sessions over the course of three days that discuss best practices and innovations in social media, blogging, e-commerce, digital branding, book publishing and more. As an exhibiting sponsor, Revolution had a booth where interior designers and all conference attendees could come by to learn more about the product and of course, see the fabric for themselves! Cheryl Luckett, owner of Dwell by Cheryl and Design Ambassador for Revolution, attended the conference, as well as Jill Harrill (Marketing Strategist) and Emily Harry (Brand Ambassador). The Revolution team had the chance to meet some great people from the design community and learned a lot too. Revolution looks forward to participating in next year's Design Bloggers Conference! The Revolution Performance Fabrics exhibit booth! Designers were able to see, feel and test the cleaning ability of the fabric for themselves! Universal Furniture, a valued Revolution customer, also sponsored at the DBC and used a Revolution sofa in their seating area!